Home » Blog » Study Plan for CAT 2019 Preparation – What to do from Today? 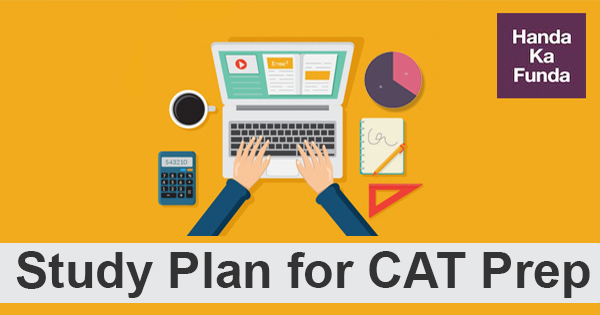 Study Plan for CAT 2019 Preparation – What to do from Today? Study Plan: A lot of students start their CAT preparation in the first quarter of the year. I personally believe that it is the ideal time to start CAT preparation if it is the first time you are trying your hand at CAT or if you got less than 90%ile in your previous attempt(s). Keeping that in mind, I thought of putting out a study plan that will benefit the students. Do keep in mind that these are broad guidelines that can help you figure out the right away and not hard and fast rules. 20% of your time – Reading books, novels, magazines, newspapers. Here is a list of recommended books for CAT aspirants. 25% of your time – Basic fundamentals of Quantitative Aptitude. Be clear with all the necessary concepts and formulas. Try spending more time on Geometry and Algebra in this period. The last time most of the CAT aspirants have had a brush with Geometry was probably in class 10th. It has been a long time and probably you need to get back into the groove. Something that you should not spend too much time on is Number System, Remainders, etc. While they are important from CAT perspective but my prior experience shows that students end up wasting a lot of time on them unnecessarily. 25% of your time – Basic fundamentals of Verbal Ability. Try and understand the concepts of grammar. Learn what Critical Reasoning is all about. Try to differentiate between statements, assumptions, conclusions, facts, inferences, judgments. These things can get really confusing at a later stage if your basics are not clear. 30% of your time – This time should be spent practicing some easy Logical Reasoning, Data interpretation, Reading Comprehension questions. This will help you understand what these sections are all about. It will also help you increase your comfort level with these areas. If you look at the CAT paper pattern from past couple of years, you can make a healthy guess for CAT 2019 as to what to expect. Your study plan needs to accommodate the fact that CAT 2019 would be heavy on conceptual clarity. If you look at the Quantitative Aptitude section of the CAT 2017 exam, it would become obvious that the focus has clearly shifted away from shortcut tips and tricks towards understanding of concepts. The fact that an on-screen calculator is available, makes the speed of your calculations redundant in the CAT exam. Keep these things in mind while you make a study plan for CAT 2019. In this phase of Study Plan, you should give at least 1 to 2 hours every day towards your CAT preparation. By July, you should have a pretty good handle on things. Ideally, you should be equally good or equally bad in all areas by July. If that is not the case and you feel uncomfortable with any specific area – this is the time that you should use to improve in that particular area. Saturday (First Half) – Verbal Ability. You are still left with three slots for preparation – Saturday (Second Half) and the entire Sunday. You should use this extra time to improve your performance in your weak area. I would also recommend that you start attempting a few mocks in Phase 2. Probably two mocks in August and September (each) should be good enough. These mocks can help you identify your weak areas if you do not know them already. Also, you should give at least 2 hours every day towards your CAT preparation in this phase of Study Plan. The last two months of your CAT preparation should be dedicated to attempting CAT mocks and analyzing them. While how to analyze a mock can be a whole different discussion, broadly – you should be able to figure out your strong and weak areas with the help of mocks. You should be able to figure out a strategy of attempting the test that suits you. This is a crucial element which often differentiates between the CAT aspirants who score 95%ile and those who score 99%ile. Also, in this phase, you will get a rough idea of what your limits are. If you are scoring in the 70s, probably it would be a good idea to target 90 and not 99. You can easily move from 70 to 90 during these last two months – provided you plan your preparation that way. A lot of students don’t introspect enough and hence end up with a percentile much lower than what they actually deserve. You should give 2 mocks a week during this period. It is important that you give them very seriously. Also, once you are done with a mock – you should attempt all questions that appeared in the mock without any pressure of time. This tactic will help you plaster the chinks in your armor. 1) Focus on the errors that you made and not on the marks you scored or the percentile that you achieved. 3) It is always a good idea to attempt the entire paper again without the pressure of time. So, allocate enough time for this purpose as a part of your Study Plan for CAT 2019 Preparation. You should give at least 3 to 4 hours every day towards your CAT preparation in this phase.